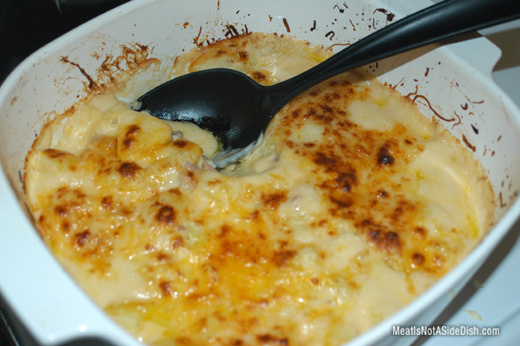 To make Cheese Potatoes & Ham au Gratin, preheat oven to 350F. Grease a 2 quart baking dish. Next, boil the potatoes (with 1 tsp. salt) for 10 minutes or until they slide off a fork. Melt 4 tbs. of butter in a saucepan, add garlic and cook for 2-3 minutes. Remove any visible garlic and throw away. Add onion and flour and cook until onions are soft. Add in sour cream and milk and stir until thick. Add in ham and 5-6 ounces of cheese, cook until cheese is melted. Stir in the potatoes. Bake in a the baking dish for 25-30 mins with the remaining cheese spread on top. For a nice browned top, place in broiler for 2-3 minutes.